The cultivated area of Vietnam is over 9 million ha, of which light texture soils account for a considerable portion of around 5.3 million hectares. These soils are sensitive to deterioration due to inappropriate agricultural practices (such as excessive use of chemical fertilisers) causing acidification and deterioration of soil health. Slash and burn, a common technique used to clear forest land for cultivation, provides fertile lands for only a few years, until these fragile soils become degraded and nutrient depleted. About 1.2 million ha of shifting cultivation in Vietnam is from slash and burn, which also releases most of the carbon (C) contained in the biomass to the atmosphere. Crop residues, such as rice straw and corn stover, are typically burned or left on the field for rapid decay. Due to high annual rainfall, severe soil erosion and leaching may occur, causing soil degradation, especially on the light texture soils on sloping land. To enhance crop yield, farmers normally apply a high rate of inorganic fertilisers, and fungicides and pesticides for pest management. These practices give a low economic return from the crop that is only marginally higher than input costs. Due to a dense population, the cultivated area per capita in Vietnam is small and will likely decrease in the coming years. Enhancing both crop yield and quality for domestic use and export is an essential target for the nation. In 2011, the Ministry of Agriculture and Rural Development announced a program to reduce greenhouse gas (GHG) emissions by 20% by 2020 compared with 2010 levels (or about 19 Mt CO2-equivalent). Collecting, reusing and managing rice straw and stubble to minimise GHG emissions and environmental pollution is suggested in the program. Therefore, using these biomass residues to make biochar is a reasonable strategy to achieve the objective of the program. However, the use of biochar as a soil amendment is limited in Vietnam. Reasons for this may include: (1) the char may be more valuable for other purposes such as cooking and space heating during winter; (2) biochar production requires special equipment and sometimes complex control measures, which can be time-consuming and labour-intensive; (3) farmers do not recognise the effect of biochar on increasing crop yield as the effect may take a while to be apparent in some soils; and (4) the country does not have a long term strategy for improving soil conditions for sustainable land management. The B4SS project will be implemented in the Northeast highlands of Vietnam, more specifically in two hamlets (Lang Dien and Deo Vai 1) of Quang Chu, a mountainous commune situated north of Cho Moi district, Bac Kan province. Quang Chu has a population of about 3,550 people including a significant fraction of ethnic minority groups such as Tay, Nung, Mong and Dao. 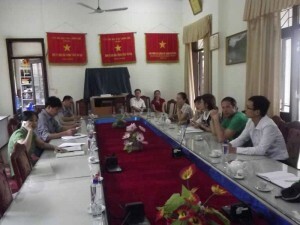 The government officials at Quang Chu commune plan to attract investment in infrastructure such as roads, schools, electricity plants and irrigation systems. However, there are some challenges. First, the transport system is deficient. Most of the roads are not paved and therefore these dirt roads become dusty during sunny days and slushy in rainy days. Therefore, it is not convenient for the people to transport goods, travel or even communicate with other residents within the commune, let alone elsewhere. This is one barrier for purchasing fertilisers, seeds and pesticides in the locality. Second, the changes in temperature and rainfall have caused increased incidence of many species of bacteria, insects and other disease-carriers harmful to human health and agricultural production. In 2014, the increase of plant diseases and insect infestation caused rice yields to drop. Food security issues are a priority for the local government. Third, floods and droughts are common. Due to its mountainous landscape with complex topography, Quang Chu is often flooded, although it can become quite dry in certain areas. In the field, there are no water channel systems, thus pumping of water from the stream or river is the main source for irrigation. Moreover, burning rice straw and maize stover in the field is very common, whereas some people may dump the crop residues into the stream and river banks. A fraction of residues is collected for use as animal feed during winter or mulch. Burning of agricultural residues on the field not only wastes the large amount of organic matter and nitrogen, but also increases CO2 atmospheric concentrations and air pollution. Additionally, famers usually graze their cattle in the forest, and therefore it is quite difficult for farmers to collect the scattered manure. The limited amount of available manure for agriculture cultivation is mainly used for growing rice. Biochar is still a new concept to the people living in Bac Kan province in general and Quang Chu commune in particular. Therefore, the people do not understand how to produce and apply biochar in their land. Moreover, the awareness of farmers about the use of biochar for crop production and sustainable land management is very low. Although charcoal has been traditionally used in agriculture, it is mostly produced in open fires, and therefore it is not biochar intentionally produced in clean reactors. In conclusion, converting crop residues into biochar for application to soil and improving the awareness of farmers about the use of biochar for sustainable land management (SLM) is required. Established in 2002, Thai Nguyen University of Sciences (TNUS) is one of the ten educational institutions of Thai Nguyen University. TNUS is the institution responsible for training graduate and post-graduate students, and conducting scientific research and technology transfer in the Northern midland and mountainous areas of Vietnam. During the last years, TNUS has pioneered in biochar research and development in Vietnam. From 2013 to 2015, a paddy rice experiment was set up in acrisols in Thai Nguyen city by Thai Nguyen University of Sciences. The biochar was mixed with bamboo, wood, rice straw, rice husk, clay, lime, ash from straw, and buffalo manure. TNUS found significant increase in yield of 45% in spring season and 74% in summer season after 1.5 tonnes of biochar per ha were applied to soil together with a relatively low dose of conventional chemical fertiliser. All the local partners that will cooperate with TNUS on the implementation of the B4SS project have prior experience in the production and use of biochar in Vietnam. The Faculty of Environmental and Earth Science (FEES) of Thai Nguyen University of Sciences (TNUS) will conduct the demonstration on agricultural research and collaborate with other partners, such as Population, Environment and Development (PED) to support clean biochar production; the Soil and Fertiliser Research Institution (SFRI) for agricultural research; and the created networks of demonstration sites and farmer groups. All the Vietnamese project partners have on-going activities in the proposed project areas in close cooperation with the government authorities at commune, district, and provincial levels. Established linkages and modes of cooperation exist with the women’s and farmers’ unions as well as the government agricultural extension system. Experiences from earlier work, the connections already established and existing activities undertaken together with key cooperation partners form the basis for the B4SS project. The Biochar for Sustainable Soils (B4SS) project include the following activities: (a) demonstration of biochar compared with alternative organic amendments and chemical fertilisers; (b) construction of appropriate biochar reactors and training to local people on how to use and maintain the reactors; (c) evaluation of alternative biochar formulations, i.e. biochar mixed with mineral matter, and applied at different rates for growing rice and maize; and (c) demonstration of biochar application to soil as a strategy to reduce pollution (eutrophication and greenhouse gas emissions) and loss of nutrient resources. The B4SS baseline survey will be conducted on 20 households in two hamlets (Lang Dien and Deo Vai 1) of Quang Chu commune to determine the most common crops grown, soil types and management practices (such as cultivation methods, fertilisers used, residue management and available biomass resources), in order to select representative agricultural systems in which to trial biochar and identify the most suitable feedstocks for producing appropriate biochar formulations. A second survey will be adjusted to accommodate changes expected to occur after training on biochar production and use, and will target the same 20 households. The focus will be on evaluating the value of the project to deliver environmental, health and socio-economic benefits to farmers. 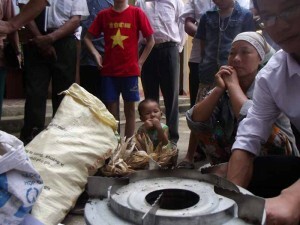 The DK-T5 biochar-making stove and DK-TR1 drum are appropriate demonstration tools for introducing the concept of biochar to the local people in the research sites. The DK-T5 stove is suitable for rice husk, sawdust, peanut shell, maize cob, wood chip, and a combination of these fuels. 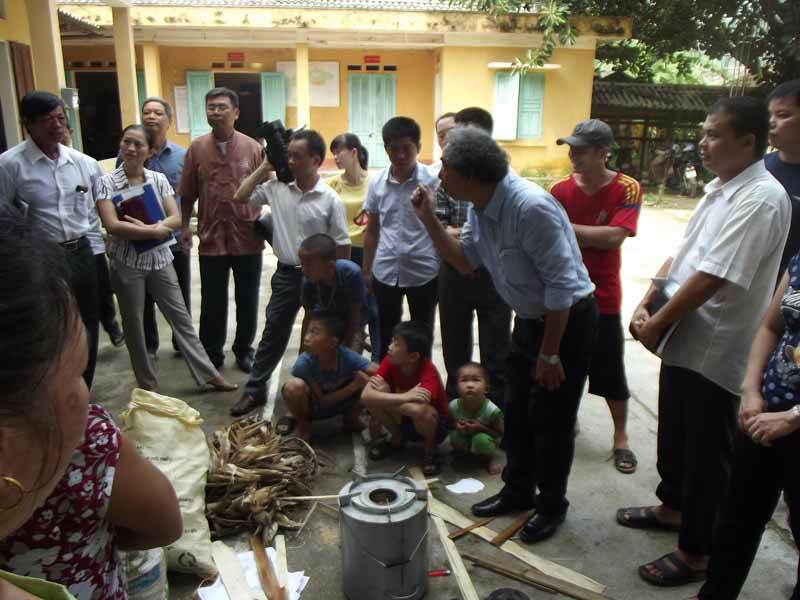 About 20 biochar-making stoves will be sold at a price subsidised by the B4SS, and two medium-scale drums will be promoted in Quang Chu. The stoves and drums will be demonstrated and farmers will be trained on how to use these technologies. To ensure that relatively high quantities of biochars with certain characteristics are produced, a large-scale kiln will be designed by TNUS and Prof Stephen Joseph. This large kiln will be built in Thai Nguyen city for testing and refining according to specific conditions and type of materials. The biochar needs to be homogeneous and in sufficient quantities for conducting the rice and maize experiments. Biochar samples will be collected and characterised according to the guidelines prepared by the International Biochar Initiative (IBI). Then the biochar will be transported from Thai Nguyen city to Quang Chu for conducting the experiment during the first spring season. Based on the design of the large-scale kiln, two small appropriate kilns will be constructed in the two participating hamlets of Quang Chu commune in order to avoid transport and fully engage with the local beneficiaries. To ensure that the kilns operate correctly and the required quantities of biochar are produced, two local farmers will be employed and trained by Hoang Trung Kien (TNUS staff) on how to operate and maintain these kilns. In order to elucidate the types of biochar formulations to be evaluated, soil samples from two households, that will serve as experimental sites, will be collected and analysed in order to identify the constraints to address. One household will focus on rice, whereas the other will focus on maize. For the experimental trials implemented under the B4SS project, if the crop yields are lower than those achieved with common farmer practice, there will be yield supports from the project to protect the households’ economy. After two seasons of experiments for rice and maize, the most relevant biochar formulations will be chosen for field demonstrations to farmers. Two demonstration sites will be set up in the two participating hamlets (Lang Dien for rice, and Deo Vai 1 for maize) of Quang Chu commune. A range of stakeholders (including students, women’s farming groups and resource managers) will visit the demonstration sites and questionnaire surveys will be conducted at the end of the visits to assess their improved understanding of biochar for sustainable land management. Moreover, a farm field school will be organised for 60 farmers to demonstrate the effects of biochar on improving soil fertility and crop growth. Booklets or leaflets will be handed out to participants at no cost for sharing knowledge on biochar production and use. The most relevant biochar formulations found in the project will be collated in the B4SS good practice guide on biochar production and application for sustainable land management, which will be produced and made available in English and Vietnamese. The good practice guide will be published as booklet, leaflets, and uploaded in the website of TNUS (http://www.tnus.edu.vn) for free download. The main beneficiaries of the project will be poor rural households that mostly depend on subsistence agriculture in degraded soils. They also rely heavily on fuel wood for cooking. At least 20 households will be provided with a biochar-making stove for their daily use. The family members responsible for food preparation and soil management – expected to be almost all women – will be trained on how to safely use the stoves and apply biochar to soil. The living conditions of these 20 families are expected to be directly improved through the inputs and activities of the B4SS project. Between 500 and 1,000 people will benefit from sharing a community pyrolysis reactor to produce biochar. Some of them will be trained on how to operate and maintain the reactor effectively. In addition to the people who will benefit directly from the Biochar for Sustainable Soils (B4SS) project, it is expected that a group of indirect beneficiaries will learn from the production and application of biochar for sustainable land management. This group will be the extended network of the participating households and farmers in the area. It is expected that each participating household will share their experience and newly gained knowledge to at least two households, bringing the estimated number of indirect beneficiaries to 2,000 people. 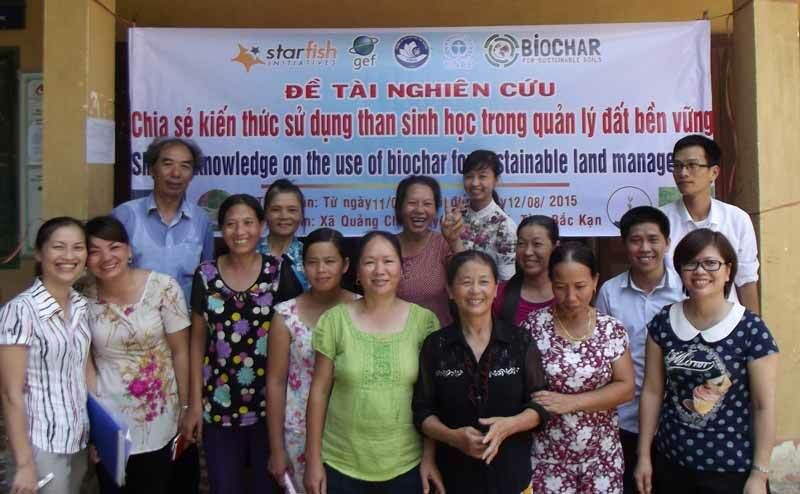 The beneficiaries include stakeholders in Vietnam and elsewhere who will be able to use the results of the project to learn more about biochar. This group includes organisations in Vietnam, relevant ministries such as the Ministry of Agriculture and Rural Development, universities, research institutions and the media. Two groups of farmers in two hamlets (Deo Vai 1 and Lang Dien) will be provided with two small brick kilns. Of the twenty families, there will be at least six families receiving in-depth training in BC production and application. In each group, two men will be trained to operate the brick kiln effectively. Moreover, 20 people from the 20 participating families, together with at least other 60 participants from different households, will be trained on biochar production and use for sustainable land management. Thus, the project will target a total of around 80 households, equivalent to about 400 people. The positive effects should begin to materialise during the project period and the results of the analysis will be documented in the project report and the B4SS good practice guide. The benefits are, however, likely to increase in the long run as the soil enrichment effects will only be fully apparent after some time in comparison with alternative soil organic amendments that decompose much quicker than biochar. The limitations of the project’s testing must therefore be acknowledged given the short timeframe and limited resources for laboratory testing and other scientific work on the soil samples.